The 2019 Greenbelt Labor Day Festival Parade will take place on Monday, September 2, from 10am to noon. The parade route is along Crescent Road, from Greenhill Road to Southway. Make plans now to participate in the Greenbelt Labor Day Parade. All participants must pre-register by August 23, 2019. To preregister, download, complete and submit a parade application form. Please contact GreenbeltLaborDayParade@verizon.net with any questions. After August 23, 2019 please check back here for a link that will provide your group’s parade line-up position number and any special check-in instructions for your group. Parade participants are asked to check in between 8am and 9:30am, and to be in position by 9:45am. All large vehicles that are in the Parade (i.e., anything larger than a mini-van, such as large vans, buses, trucks, and fire engines) are required to be checked in no later than 9am or forfeit their original parade position and be placed toward the end of the parade. Check-in Procedure (same as in previous years): Unless otherwise instructed, parade participants should check in by entering Crescent Road from Kenilworth Avenue. From 8am until about 10am on Monday morning, all vehicles entering Crescent Road off of Kenilworth Avenue must turn left at Ridge Road. Parade participants must then turn right at Ivy Lane and check in at the corner of Ivy and Lastner Lanes (C), where you will be provided with your parade line-up position number. If your vehicle will be in the parade, you will be instructed to proceed to the right on Lastner Lane and then turn left on Crescent Road to your line-up position. If your vehicle will not be in the parade, you will be instructed to proceed to the right on Lastner Lane and then turn right on Crescent Road and on to the Buddy Attick Park parking Lot (P) where you may drop off your parade participants and/or park. You may leave the area by proceeding down Crescent Rd toward Kenilworth Avenue. The map below shows the organization of the parade and detour routes around the parade route and parade line-up area. The parade route is marked in green, and the parade line-up area is marked in blue. Line-up positions 1 through 100 are marked by numbers posted on telephone poles in the parade line-up area. Detour for parade participants: Parade participants, who need to get to locations B, H, G or S, use the solid red detour from Lastner Lane to Ridge Road and the appropriate dotted purple detour after that. General detours: Others should use the solid red detour (Hedgewood Dr. to Lastner Ln. to Ridge Rd.) 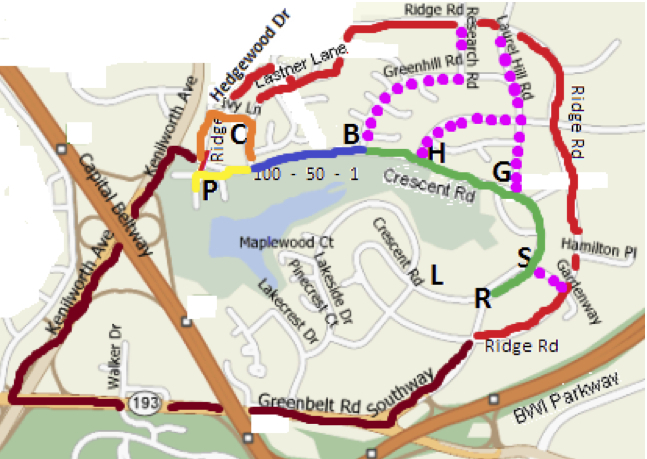 or the solid brown detour (Kenilworth/Greenbelt/ Southway) to get around the parade area. When you reach the end of the parade at the Reviewing Stand, please continue to proceed along Crescent Road to the vicinity of the Greenbelt Library (location L). A shuttle bus will be available at that location to take you back to the Buddy Attick Park parking lot (location P). Follow us on Facebook or Twitter receive updates on the Greenbelt Labor Day Festival. You may also subscribe to receive email updates at the bottom of this page.